From on the ball to ballin’. You’re looking at the U.K. charts wondering if The Saturdays will remain at #1 or if Justin Timberlake will reclaim the title when, suddenly, you realize that neither of them is in contention. #1 on iTunes at the moment is… PJ & Duncan AKA? What is this, 1994? Apparently so. A former top ten hit “Let’s Get Ready To Rhumble” by the duo, who are now more famously known as the hosting duo Ant & Dec, has skyrocketed back into the pop stratosphere after the duo performed the song on their weekly Saturday evening program Ant & Dec’s Saturday Night Takeaway. It’s held down the #1 spot on iTunes since Sunday and has a steady lead, though it’s slipping a bit, understandably, given that the performance was a few days ago. This comes a little under twenty years since the two released their debut single as a music act. Can the two hold on to claim their very first number-one single? Here’s a look at all the notes they’ve hit so far… and what might happen come the Sunday chart update. The duo of 37-year-olds Anthony McPartlin (PJ) and Declan Donnelly (Duncan) began on the BBC television series Byker Grove in 1990 when both were in their teens. Donnelly had joined the show the year prior, and when their story lines intertwined on the children’s show, so did their personal friendship in real life. The duo signed to Sony BMG Records in 1993 as their characters PJ & Duncan AKA, creating an album called Psyche, which is referenced in “Rhumble”. Things started out slowly for the two, missing the top 40 on their first attempt, then climbing as high as #27 with their second single, “Why Me? (Is It Justified? )” It wasn’t until the summer of 1994 that “Rhumble”, which used that famous phrase from boxing and wrestling, became the needed breakout hit for the duo, spending two weeks at #9 in August. That aforementioned parent album, released a few months later, was certified Gold and went to #5 on the strength of the song and a few other minor singles like ballad “Eternal Love” (#12) and the catchy “Our Radio Rocks” (#15, 1995). In 1995, the two released Top Katz, which saw them began to co-write most of their material, but failed to meet the expectations of their previous era. With it came three mid-charting singles, including a 1996 remake of “(I’m Not Your) Steppin’ Stone” by The Monkees (released as simply “Stepping Stone”), which went to #11. It also became their only single to make the top 50 in Australia. The two began to easily pick up hosting gigs at this point, but they decided to make one more album in which they renamed themselves Ant & Dec to match a show name they were hosting at the time. After all, they had to shed their former image somehow. 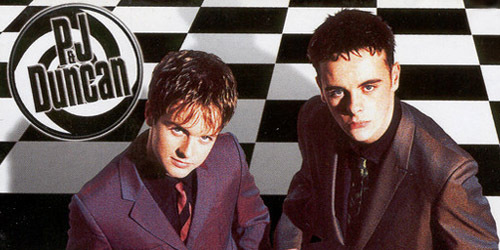 The Cult of Ant & Dec, released in the spring of 1997, yielded four more top-20 hits, including two #10 singles: the retro-tinged “Better Watch Out” and the slower “Shout”. A copyright infringement case over what would be the latest single of the album ultimately ended their steady music career, but it was soon after that the duo began popping up on shows like CD:UK and Pop Idol, and later, Britain’s Got Talent, I’m a Celebrity…Get Me Out of Here! and the recently reintroduced Takeaway, just to name a few shows. As far as audiences here in the States, we barely know who these two guys are. None of their music releases were ever released here and are still not available to buy on iTunes or stream on Spotify. They’ve rarely (if ever) been on television here: all the talent shows here have generally picked American hosts. In fact, they’re probably best known for a cameo in 2003’s Love Actually if anything. However, as someone who is generally in tune with what’s out in the U.K., I say, you go guys! We’ll see where things go from here. At sales of 46,000 copies so far this week according to the Official Charts Company, it’s a hit once again, so “let’s get ready” to celebrate. UPDATE: “Let’s Get Ready To Rhumble” made it to #1 on the official chart update, giving PJ & Duncan AKA their first #1 hit in the United Kingdom and their biggest hit ever. It remains at #1 on iTunes there. What do you think about this recent chart story out of the U.K.? Do you think other acts will be able to benefit from the same exposure? Let me know in the comments or on Twitter: @AdamFSoybel.